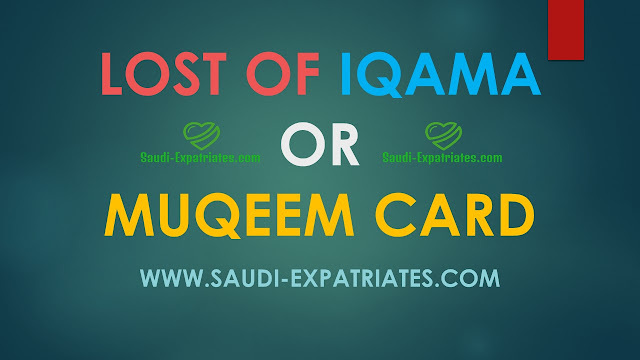 Saudi Expatriates blog brings an another valuable article for our blog readers, Who lost their Saudi Iqama (Muqeem id card) and do not know what to do after that. There is simple yet little difficult procedure you have to follow, if you lost your iqama or muqeem card. - According to the Arab News (Dated: 24-03-2014) If your iqama is stolen, Report it within 24 hours and avoid penalty. - Firstly make sure you check all possible places to find your Muqeem or Iqama, If you still unable to find your Iqama then you should report it to your sponsor. - Make a written note in Arabic, how you lost and where you lost. Then report it to the police with the help of your company person, who deals with your company iqama's or your company will arrange someone else. - Your sponsoring kafeel should arrange Arabic written note in your company logo letterhead signed by Chamber of Commerce and it should explain how you lost and where you lost. (Skip Chamber of Commerce sign, If you are employee in the public sector or government companies like Saudi Arabian Airlines, Saudi Aramco, SABIC in which countries own 50% of capital). - Specific person from your sponsor should visit Jawazat with Letter pad Arabic written Note, Two Photographs, Copy of Lost Iqama, Copy of Passport, Payment proof of Fine (SR 1000/-) and fee (SR 650/-) and Jawazat filled form. - If everything is fine, You will get a print of Iqama or Muqeem Card on the same day or next day. It is recommended to keep your contact details under your wallet where you put your Iqama. If someone found your lost iqama he may return you In Sha Allah.